A filter is a statement instructing a search to extract objects of a certain type with a specific property having a specific value or a value within a defined set. You can add a number of filters to a Model Search or Document Generation, to more precisely define the objects or information to extract from the model. Filters can be applied to a model search, and also to document generation to filter the elements that are reported on. Click on the drop-down arrow and select the type of object to search for. Initially, when there are no other filters selected, the drop-down list provides the full range of top-level objects. Select the checkbox corresponding to each field that the search is to evaluate. Select the checkbox if the object must have this property to be included in the search results. Provides the name of the field to be checked in the search. the text string in the '<Search Term>' field for the search, or a more specific value defined in the 'Value' field. If the search is to look for a value provided by the person running the search, leave this field at the default value of '<Search Term>'. Otherwise over-type the field with a specific value or, if the 'Condition' is 'One Of...', type a selection of values separated by commas. 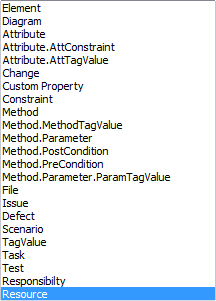 For some filters and conditions, the 'Value' field contains the button. Click on this to display a selection dialog. This dialog varies dependant on the information required. Click on this button to select all of the 'Add Filter' checkboxes to include all filters in the search definition. You might then deselect specific checkboxes to remove a small number of filters from the search. Click on this button to clear all selected 'Add Filter' checkboxes to omit all filters from the search definition. You might then select specific checkboxes to include only a small number of filters in the search. Click on this button to apply the filters to the search definition. The selected filters are displayed in the 'Query Builder' tab for the search definition. Click on this button to close the dialog and cancel the changes you have made.